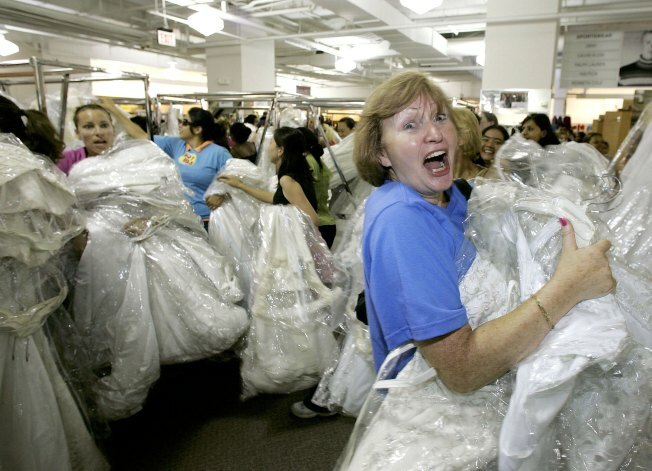 A scene from the annual Filene's Basement's bridal gown sale -- a.k.a. Running of the Brides. It seems the discount retail chain known for the annual running of the brides couldn't outrun its creditors. Filene's Basement said Monday it has filed to reorganize under Chapter 11 bankruptcy protection, less than two weeks after its new owner said it was reviewing "all available options." The privately held company also reached a deal that will allow a Crown Acquisitions affiliate to buy 17 of its 25 stores, including its flagship locations in Boston and New York. The agreement is subject to a bankruptcy court auction, which is expected in about five weeks. Eleven other stores are being closed, according to the Washington Business Journal. The auction will allow other companies to submit bids for the 17 stores, as well as for the rest of the Filene's Basement locations and the chain's other assets. New York-based Crown, a real estate and asset management company, plans to continue running the 17 stores under the Filene's Basement name. Buxbaum Group, a California-based liquidator, acquired Filene's last month through an affiliate company, FB II Acquisition Corp. The sale came after the previous owner, Retail Ventures Inc., said the chain was experiencing "significant liquidity problems." Filene's Basement, known for its "Running of the Brides" wedding gown sale, was founded more than a century ago in Boston.